Earlier in November I had the pleasure of meeting Chef Nate Smith at his Pie For Dinner event at Four & Twenty Blackbirds. While chatting with him he suggested that I should pay a visit to Roman’s in Fort Greene where he was currently working. And the Wednesday before Thanksgiving I did just that. 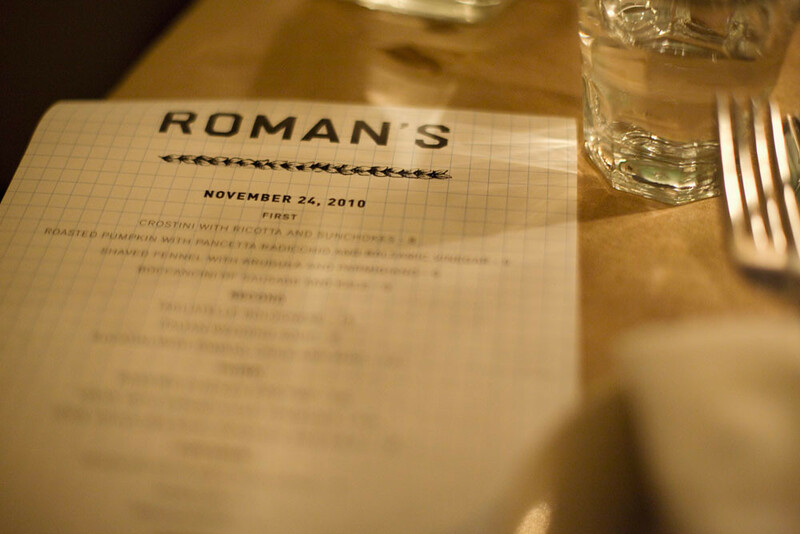 Roman’s, which I realized later that it was a place I wanted to try before, is part of the Diner and Marlow & Sons family. It was the night before Thanksgiving and I got to leave work early that day. Not knowing how pack this place gets at night I wanted to go slightly earlier. I met Howard at Roman’s at 6pm and as usual he was there before me. I’ve never been to this part of Fort Greene even though it’s only a block away from the Brooklyn Flea. By 6pm the place was pretty much filled up. We sat down in our little table for two and looked over the menu. Each course had about three to four items which I find to be just the right number of choices I like for each course. 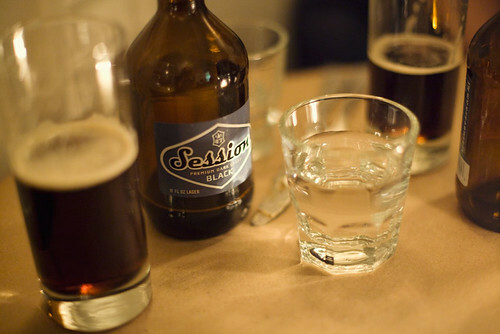 Both Howard and I started the meal off with a bottle of Full Sail Session Black for each of us. I liked it a lot, it was sweet and now you can buy a whole case over at Eastern District, you know if you were wondering. 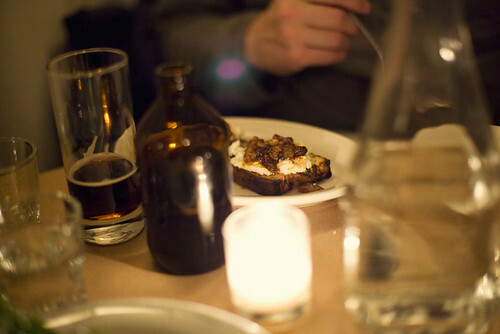 For appetizer, Howard got the tasty sunchokes with ricotta crostini. We think there were also blueberries in the mixture. I had a bite and it was good. Sweet and savory. 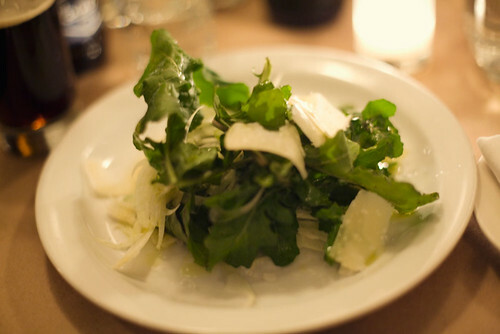 The salad I had was great too arugula and fennel with shaved parmesan. 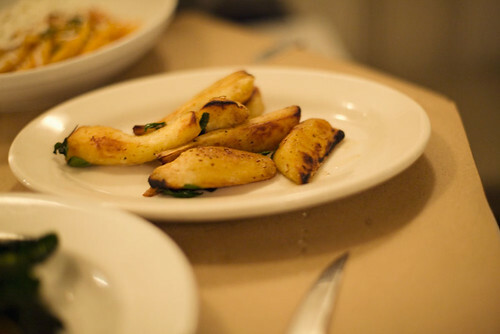 Howard: The roasted parsnips were my favorite part of the meal. The ricotta on the crostini was very rich and creamy. My pasta, bucatini, tomato sauce, topped with ricotta salata, was simple but delicious, though served just a notch above room temperature (and the pasta was cooked perfectly). We got another round of Full Sail. 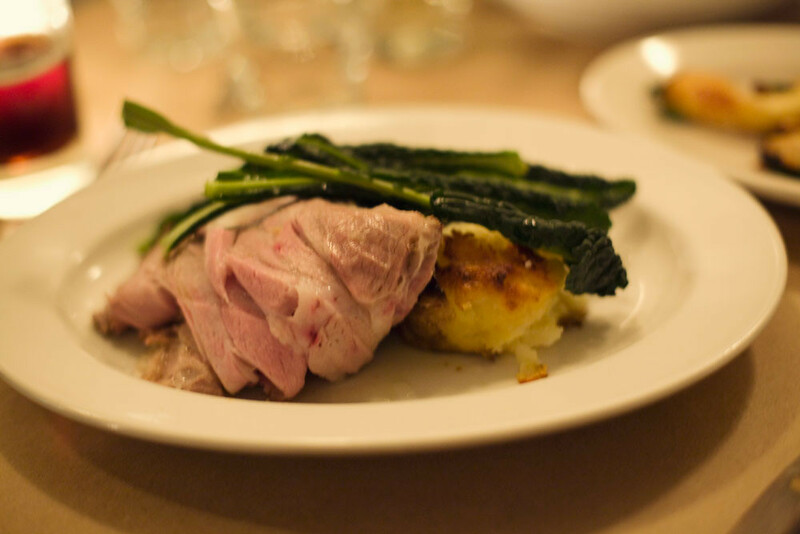 As for me I got the roasted pork shoulder with a crispy potato and greens. Oh man the pork shoulder was perfect. It had the perfect ratio of fat and meat to make it tender and juicy. The whole dinner was simple and good. I was pretty full by then and wasn’t thinking about desserts until the waiter told us about dessert. 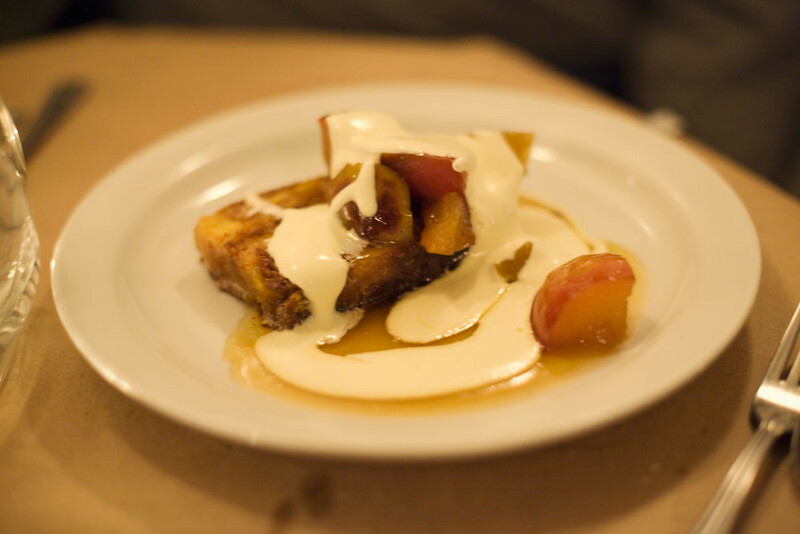 That night’s dessert special was croissant bread pudding with anise cream(I think). Oh wow, Howard and I shared it and I really REALLY regret sharing. It was crazy delicious. After going to Roman’s I’m even more tempted to go to Diner and Marlow and Son’s. It’s just good food simply done.